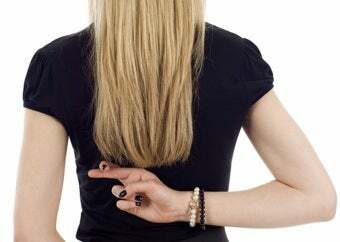 Is It Ever Okay To Lie To Your Loved Ones? Juliet Bridges and her husband are getting a divorce. Her future ex-husband hasn't been living in the family's home since Christmas—but her two children, ages 7 and 9, still don't know that he's never moving back in. In a Guardian piece titled, "Why I Lie To My Children," Bridges explains that she hasn't broken the news to her children yet because "we don't want to upset them. And because once we've done that, there's no going back." The longer Bridges and her husband have hidden the truth from their children, the harder it has become for the two of them to confront reality; she notes that the one time she came close, telling her daughter that she wasn't sure if she and her husband were going to split, "the results were cataclysmic. 'There won't be a happy-ever-after,' she wailed over and over. My little boy simply refused to believe it. 'Don't be silly, Mummy and Daddy will never split up,'was all he would say." Bridges also has to deal with resistance from her husband, who shoots down her argument that perhaps hiding the truth from their children will cause them to blame themselves for the situation they are in, believing that perhaps their father is gone because they've done something to drive him away: "When I run this hypothesis by my husband, he is incredulous. His attitude is: 'What could they possibly imagine that's worse than that their parents are splitting up and can't live together?' He doesn't buy the idea that our kids are suffering, their school work has never been better and they are a lot more sprightly, he points out, since he moved out." Aware that the lies—meant to protect the children—are possibly going to make the truth sting that much more when it finally comes out, Bridges discusses her coping method with child psychologists; one of them, Karen Doorbar, who notes that Bridges' slow approach to letting the truth leak out isn't as damning as she originally thought it could be: "A gradual process is quite kind," Doorbar tells her, "You can say, 'Daddy is away, he's got a lot to think about.' Then, 'He loves you and cares about Mummy, but he is staying with friends for now because he's feeling worried. The 'cut-throat' way of breaking the news: 'Daddy's gone and he's not coming back,' tends to be more traumatic. The first stages should be gentle. You don't want to plunge your children into an unknown world. The fact that they are seeing a lot of Dad is great. It's kind and compassionate." Bridges also discusses her own experience with parental lies, as her father kept her mother's brain tumor a secret from her as a child, and she was not aware that her mother had actually died of the tumor until years later. My own parents dealt with my beloved grandmother's illness in a similar way when I was a teenager, (and perhaps a cultural way, being Irish Catholic and all), leaving my sisters and I out of the loop as my grandmother quickly became sicker and sicker, giving us only vague details like, "Well, she has some internal bleeding, so they have to find it and just fix it up," when in reality, she was dealing with a very aggressive breast cancer that would eventually take her life. As my mother had already lost her mother to cancer; in some ways, I think, by not bringing the c-word up and keeping it from us, she was trying to protect us from what she knew was coming. We eventually found out why my grandmother was so sick, and it did, admittedly, add a sense of urgency and fear, though in the end, it didn't matter what had taken her, as much as it mattered that she was gone, and dealing with the loss would have been the same even if my mother had told us my grandmother's diagnosis from the very beginning. Eventually, all secrets have to come out; Bridges' children will someday understand that their parents are not together anymore, and they'll have to process that in their own way. Whether or not her particular method of gradually letting them become comfortable with the split will help or hurt is yet to be seen, and though I imagine that the fact that the couple has already been living separately for some time now will make it somewhat easier for the children to transition, I also imagine that the definitive answer of "no, we're not getting back together," will be traumatic and difficult regardless of how prepared the children might be. So what do you think, commenters? Is it ever okay to lie to spare your loved one's feelings? Or is it easier to rip off the bandage right away and hope that the truth will help them process the often difficult realities of life?